The machine was developed after C= where certainly doomed to bankruptcy, we had advanced warning and purchased all the remaining stock of Amiga 4000's but we did not have enough machinery to keep the company afloat whilst we developed the PC version of our software. During a meeting with management whilst discussing the fate of the company and what we where going to do I posed the ideal that we could build everything bar the motherboard from 3rd party peripherals and hack it into a case, and we should investigate whether we could get any motherboards from C=. We managed to purchase 1000 Amiga 4000 motherboards from unassembled and spare parts stock from C= which where distributed across the various Scala offices around the world and sold as "Scala Workstations". The first batches in the UK where built into PC cases and their back plate holes where covered with a plate that we had made at a local engineering firm, these didnt fit and so I spent many hours filing down the plates to fit the cases. Our stock in the UK ran dry pretty quickly so we looked at repeating the process with the A1200, by then the 3rd party market had cottoned on to the idea of recasing Amigas as tower units and we used an off the shelf solution from Ramiga, I worked on the first 2x A1200 machines that we used but the case design had an earthing problem. I left the firm at this time, but gather the problems where resolved in the next batch from Ramiga. The specification on all units was proprietry as they where specced to customer needs with the first 1000 units being based on A4000 motherboards, in all the A4000 based machines the processors where above C= speccification because we used 3rd party expansions to fit them out, in some cases 060's. All later units where based on the A1200 motherboard. 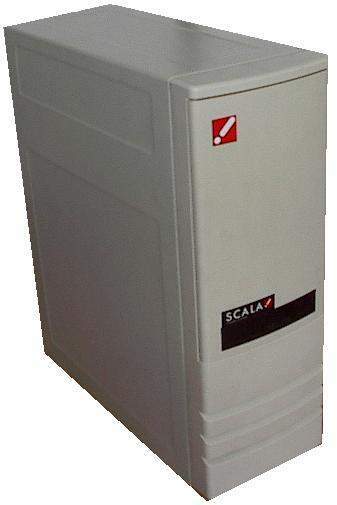 The machines where used for multi-media presentation and point of sale, and where sold with Scala Infochannel software or in some cases Scala MM software.